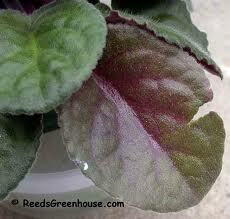 African Violet propagation by leaf: Buy here. - Alex invites you into his world. Click Buttons to pick your named varieties leaves: Give alternatives should a variety not be available. Add two tablespoons of dolomite to 4 litres of Peat. Select a medium-sized leaf from the centre of the plant. Avoid leaves that are: large and floppy, marked or spotted, or small and immature from the middle of the plant. Cut the leaf off cleanly from plant with a 2.5 cm (1") long piece of stem attached. Trim the base of the stalk with a slanting cut. Also take of the very top of the leaf; this stops the leaf itself growing. Dip the stem in hormone rooting powder. Using the dibble to make a hole in the propagating mix and insert stem of leaf into the hole so the leaf is just above the mix. Repeat using as many leaves as you can fit in the pot without the leaves touching each other. Rest the leaves on the edge of the pot. Water and cover the pot with the plastic bag placed around the bent wire to keep the plastic away from the leaves. Place the pot in a spot somewhere between 16 to 26 degrees celcius, well-lit spot. New plants will form around the base of the leaf in four to 12 weeks. They can be separated into their own pots when the new plants reach a size of about 5cm (2.5").